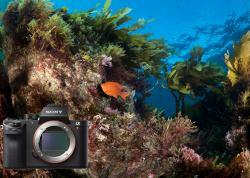 We share our top ten tips for capturing amazing underwater portraits. Have you ever taken a photo, reviewed it on the LCD screen, and thought to yourself, "Nailed it!"? Chances are you have, and chances are it wasn't on accident. We've compiled our Top 10 Tips for Amazing Portraits, and we'll share some of our favorite underwater portraits as well. Be sure to take some notes, and refer back to them before your next underwater adventure. Hey . . . I don't see you writing! 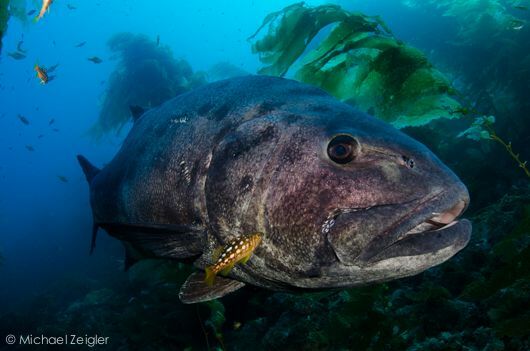 Giant Sea Bass at Catalina Island, CA. With this portrait in mind, I knew where these critters reside, and had an idea of the strobe settings/positions. After spotting it from afar, I took a few test shots to make sure I had the ambient light dialed in. Then I moved in very slowly, with relaxed breathing and avoiding direct eye contact (except through the viewfinder). 1. DO YOUR HOMEWORK: Whether it's via the internet, books, or talking to fellow divers, be sure you know what you're looking for, and where to find it. Knowing how to approach certain subjects is paramount as well. You've invested of money and time before you even giant-stride off the boat. You may as well go the extra mile and study your subject. 2. 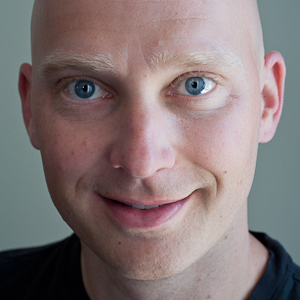 FILL 2/3rds of the FRAME: Successful portrait images tend to dominate a majority of the image. The subject occupies most of the frame, and may include a bit of its environment. 3. BE PREPARED: You never know when a potentially great subject will present itself. 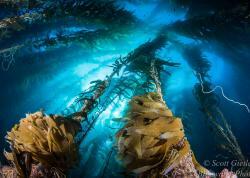 When entering the water while shooting wide-angle, I always start with my camera settings set to my default southern California settings: 1/125, F11, ISO 320, strobes out to the sides at 1/2 power. 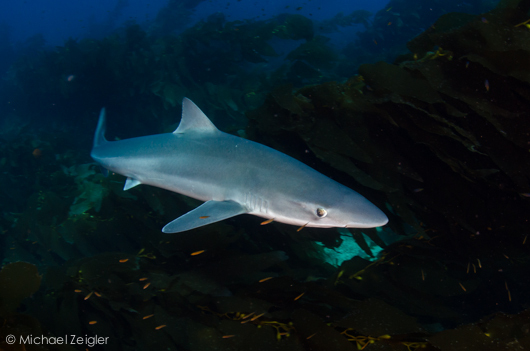 Soupfin shark at San Clemente Island. Had my camera been set to something other than my default settings, I most likely would have missed this shot. I only had time to think, "zoom in!" and then she was gone. This was my first encounter with this species of shark in 475 dives in southern California. 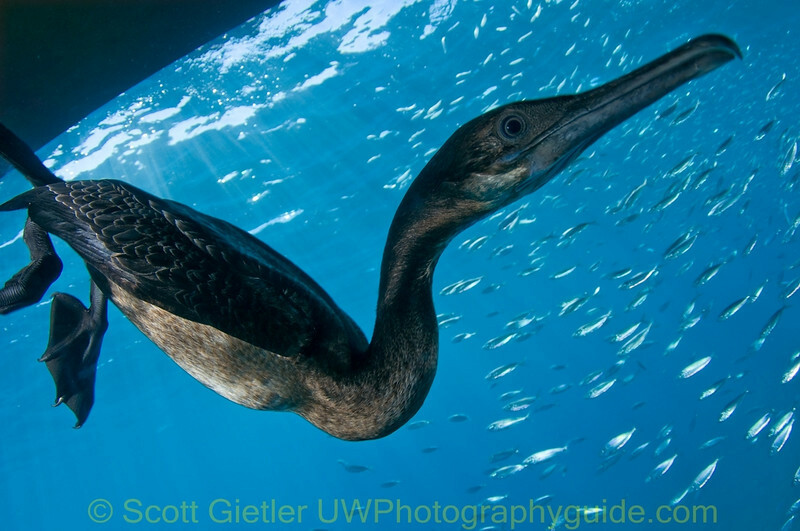 Being ready, and persistent, enabled Scott Gietler to capture this awesome portrait of a cormorant! F10, ISO 200, 1/250th. Tokina 10-17mm lens @17mm. 4. CONNECT WITH THE VIEWER: This is most often done by having solid eye contact with the subject. Just make sure that the eyes are in sharp focus. This is a fantastic example of sharp, direct eye contact. 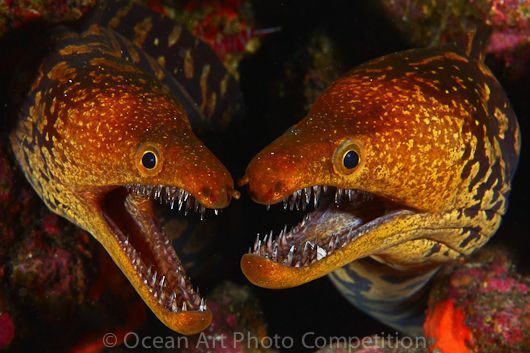 This is a portrait by Luis Miguel Cortes Lozano, who won 1st Place in the 2011 Ocean Art Photo Contest with this photo, "Twins". 5. CUTE or RARE SUBJECT: These always seem to get the attention of the viewer. How can you go wrong? Obviously rare subjects are harder to come by, but are more rewarding when you do capture an image of one. 6. USE THE RIGHT LENS FOR THE SHOT: This ties back to #1, but it's imperative that you have the right equipment to get the shot you're after. Do you need more working space for a skittish or shy critter? Then use a 105mm macro lens instead of a 60mm. Do you need to carry a close-up lens? 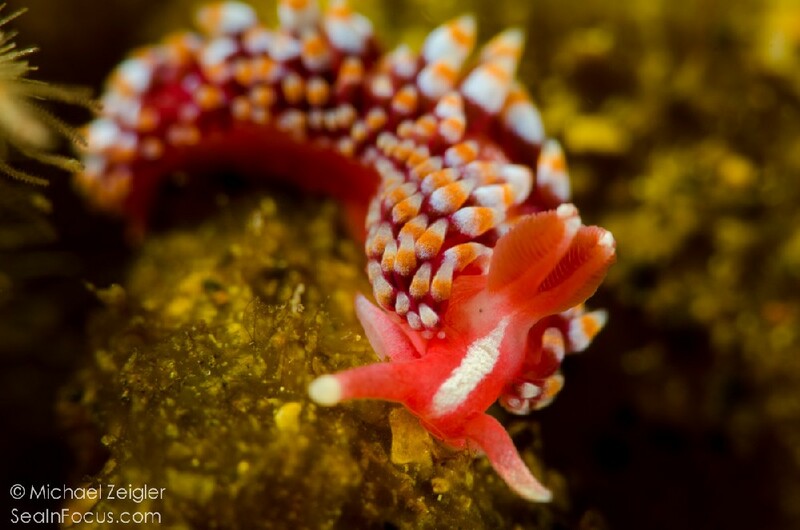 In anticipation of seeing such a small nudibranch, I used my 105mm macro lens, and carried a +10 SubSee diopter. I'm glad I did. This image is uncropped at F25, 1/160, ISO 200. 7. 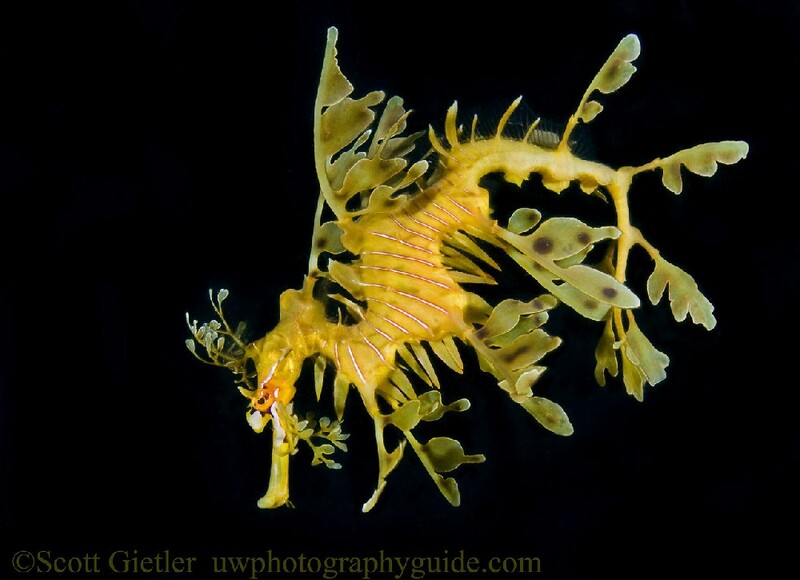 GET CLOSE: Getting close is the underwater photographer's moniker. And sometimes that means getting uncomfortably close. I am by no means endorsing getting anywhere near a dangerous critter. 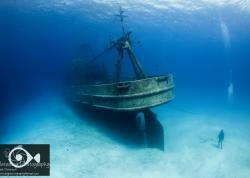 However, Todd Winner did, and the image below is awesome. A bit too close for my comfort level, but Todd Winner makes it work. 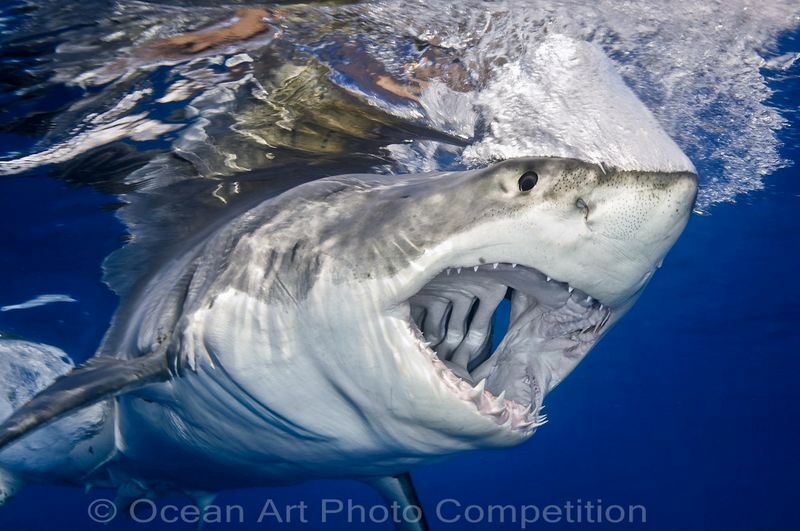 Erin Quigley gets up-close and personal with this Great White, which earned her 4th place in the 2010 Ocean Art Photo Contest. 8. 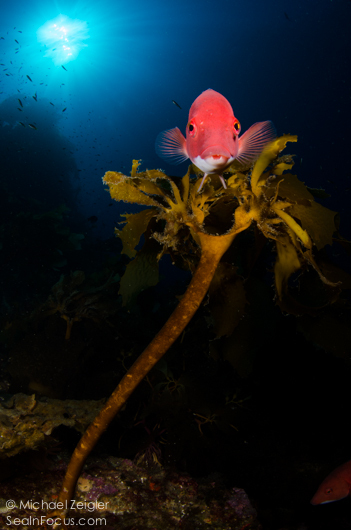 USE THE SURFACE: Reflections are a great way to enhance an underwater marine life portrait, as it not only shows the viewer exactly where the subject is in the water column, but also adds an artistic touch to the photograph. 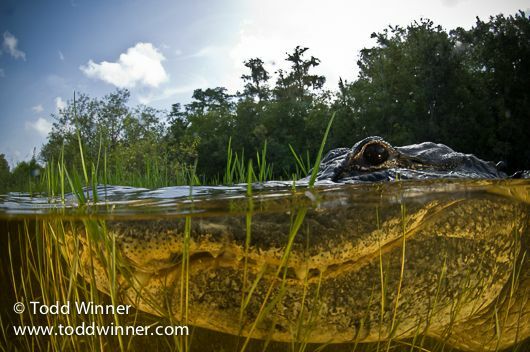 A great use of the reflective surface, by Todd Winner. 9. AVOID DIRECT EYE CONTACT WHEN APPROACHING: How you approach a subject can be the difference between getting the shot and, well, ... not. I've found that eye contact is ok, as long as it's not both eyes staring right at the subject. Animals often interpret direct eye contact as a threat, since you're focused solely on them. Avoiding this will allow you to get relatively close and capture that crisp, colorful photo that you prepared for. 10. SHOOT HEAD-ON: Instilling a sense of "I'm looking at YOU" to the viewer is a great way to create a successful portrait. 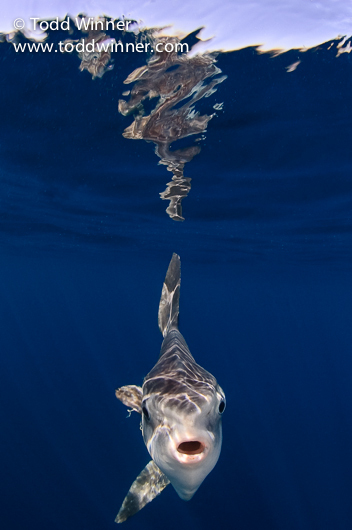 In the example below, I do this by waiting until this female sheephead is facing my dome port head-on, with both eyes facing forward. In my opinion, this portrays their inquisitive nature. I have several other frames showing just one side of the fish or the other, but to me, this is the best of the bunch.